Seville greeted us with smoldering heat and a town of ghosts…. Walking the streets after 3p.m you would think that the entire population of the city has been abducted by aliens. They really do take their siesta very seriously around here, and no wonder, the afternoon blistering sun is the kind that can drive you to madness. The city literally dies from about 2 pm to about 7 p.m., when the hellish sun starts to subside. That only leaves a few hours of business in the morning and a few hours at night, which explains a lot about the state of Spanish economy. Sleepy, sweaty tourists are wondering the ghostly streets looking for something to do, visit a site, eat or shop, but all the attractions close in the afternoon and the shops and restaurants, even if open, have no interested in selling you anything. The imposing gorgeous Seville cathedral, which dates back to the Moors and combines the architecture from practically all periods, was closed even though the sign outside indicated it should be open for another ½ hr. So we headed toward the main royal palace or the Alcazar with no hopes of getting in as the guide book indicated it should be closed now. One thing I learned traveling in Spain is that information provided in guide books, web sites or even on the doors of all attraction sites should not be trusted. Things open and close based on their own unpublished schedule and you should consider yourself lucky you got in at all. Alcazar’s architecture is representative of the region’s history. It combines the Arab style castle with Gothic and Baroque elements… it is beautiful. You can’t stop staring at the intricate carvings covering the walls, the starred and gilded ceilings and domes, the pools of water interlined into gardens and courtyards… It makes you think of Arabian legends and Sheherezada’s tales in 1001 nights. There are plenty of interesting things to visit in Seville, as long as you manage to stay out of the outdoor shopping mall which occupied about quarter of the city. Littered with shops of every possible brand name, I felt like I did not leave the US. The part of Seville I loved is tucked into the old part of the city, around tiny streets and plazas lined with orange and lemon trees. Small restaurants hiding away in courtyards, which you could never even see from the street but can only discover by shamelessly peeking into open doors, never knowing if you would find a restaurant, as store or a private families’ gathering. As long as you learn to keep the clock like the locals, you can discover amusing things to do like stroll over the Trianna bridge, right behind a 14th century church there is a nice food market (Merkato de Trianna). I was hoping to find a spice stall or some dried fruits and nuts (you would expect this in the south of Spain, where the culture is still very heavily influenced by Moors). There were no spices, no nuts, no olive oil, not tea or coffee. Lots of great pork and game and seafood though, but I couldn’t quite tuck a raw pork chop into my suitcase. These are lives snails and the original and traditional protein for the paella... we were lucky to taste one that evening. The food in Seville was typical tapas, good some places, not so great in others. Walking alone the streets littered with outdoor tables, looking at what other people are eating is a good bet in choosing a place. If a restaurant seems busy and you like the look of dishes on people’s tables… go for it. I had some amazing gazpacho served with a slick of good olive oil on top, some wonderful grilled sardines and some more octopus, this time grilled and served with a bit of thin pesto. The brazing liquid from the ox tail stew was scented with cloves and orange peel, which is the idea I will certainly steal. All things prepared with only a handful of ingredients, yielding such complex flavors, I was surprised and hopefully inspired. By the time we were ready to leave Seville, we have walked every tiny street at least twice and some waiters begun to recognize us… a definite sign we overstayed in this town. A three hour train ride to Granada was uneventful, with nothing to look at except and endless sea of olive trees. Granada’s main attraction is the Alhambra, which is huge castle, palace, almost a city in size, atop of a giant hill. It contains the Nasrid palaces, a site one needs to visit at least once in a lifetime. People come from all over the world and most seek nothing else of Granada except Alhambra; it remains Spain’s most visited historical site. But be warned, the Alhambra complex sits on top of a very long, very steep hill, which we climbed not once but twice, thanks to my son’s complete inability to read a map. 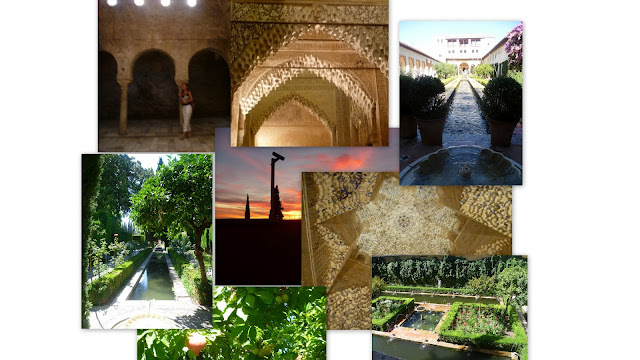 The palaces, baths and the Generalife gardens leave Seville’s Alcazar in the dust and are not the site that can be explored quickly. As we were strolling though these magical places, we were trying to imagine how life looked in them back in the day. It was easy imagining yourself as part of Emir’s entourage or in my case most likely part of the harem. Granada is a charming little city with streets lined with orange, lemon and pomegranate trees , an occasional apricot tree, which beautiful ripe, delicious fruit, which went untouched by the locals and tourists… until we go there… There is a maze of little streets leading up to a beautiful Cathedral, and many palaces, which were unfortunately closed seemingly permanently, because we could not find any evidence that they ever open despite conflicting information in the guide books. 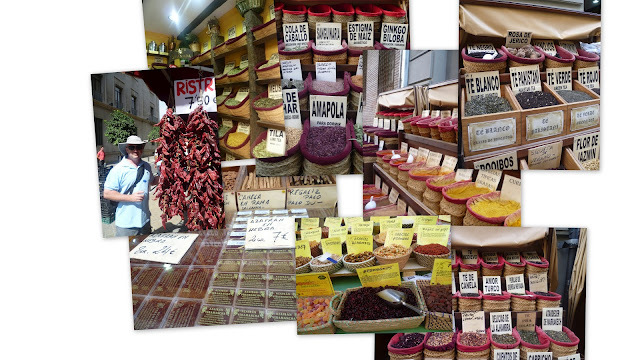 As we explored the city and walked along the Cathedral wall, I turned a corner and finally got what I was looking for… a real, genuine, Arab spice market…. My eyes jumping out of orbits from excitement and my nostrils at the ready to experience the good, the bad and the exotic, I went to explore. These were the flavors and scents like I never experienced, things tasted and smelled like they meant to, just fresher and more pungent. To my pride, I could identify almost every spice and pepper by site, it got a bit more complex with dried herbs and plants. At first it was easy, oregano, rosemary, lavender, a few plants I only know the names of in Russian, but that I walked inside the shop and saw dozens of baskets filled with plants I have never seen. I decided to stick to basics and buy only the spices I use and use often, so countless little plastic beggies later, I moved on to teas. We are a big tea drinking family, but are lazy when it comes to making proper loose tea. Sticking a tea bag in a cup is much easier, that is why I still have tea from Scotland. Here, I could not pass up the opportunity to stack up on tea blends from all over the world, black, green, red teas blended with herbs, fruit, spices in every imaginable combination. I had to restrain myself as I had no idea how much all these spices and teas were to cost, there were no prices anywhere. Before I went inside to pay, I checked out the saffron section and here with the prices posted, I was amazed and how comparatively non-expensive saffron was to the one sold in US. I thought for sure, there must be something wrong with it. The nice woman who was helping me through the whole shopping spree saw my reluctance and let me try and taste all the varieties. This was definitely very good quality saffron an there was nothing wrong with it; I was still not sure which one to pick, so I asked her which one she preferred. With not one common word of language between us, we seemed to understand each other perfectly; she even gave me her saffron rice recipe and advised me on the properties of each tea I bought. So back in the shop with my credit card in hand, I was mentally calculating how much the mountain of teas and spices and all that saffron will cost and beginning to sweat, but when my total bill came to only 51 Euros I though the nice woman made a mistake. I expected to pay at least twice as much, if not more for the things I bought… Not believing my luck, I grabbed the bags and headed into the maze of an Albacin, which means market in Arabic… The market is touristy, but pleasant enough, replicating the crampness and feel of the medina. With little shops selling all types of local souvenirs, pottery, hookah pipes, harem pants and embroidered pillow cases. The food in Granada was mediocre at best. A little tired of uninspiring tapas we had high hopes for the street of tea houses serving Middle Eastern cuisine. The day before, we were very impressed with the selection of coffee and tea there, having a menu of more than 50 teas and as many coffees, served according to consuming culture’s preference. For example, my daughter’s Pakistani tea with a black tea blend served with milk and sugar. My Moroccan tea was delicious with fresh mint leaves blended with very light and delicate black teas and spices. Arabic coffee was prepared with cloves and the little honeyed pastries were flaky and delicious. As good as their tea was, the food was lacking, the cous-cous was bland, the kababs dry and the soup plain inedible…. Well, they do have a nice ambiance and they are called tea houses for a reason. Another thing about food in Granada is the portion sizes. I don’t know who they think all these tourists are or where do we come from, but it looks like Granadian chefs watched the “Super size me “ documentary and thought it was a good thing… The portions are enormous… even for tapas. One tapa plate can be counted as a full dinner plate and a little appetizer of cheese and pate turns out to be enough to feed ten. A pitcher of Sangria is assumed to be a minimum of full litter and a little order of grilled pork and French fries for my daughter was so large, the plate had to be carried on the tray with two handles. One of the favorite’s treats throughout our trip was breakfast of toast and tomatoes. It is a traditional Spanish breakfast and will surely become a staple in my house. Simply grilled toast is drizzled with olive oil, topped with finely chopped fresh tomatoes, topped with more olive oil and salt. Simplicity is key, all that matters is the quality of the tomatoes and the olive oil. And how do you know a good olive oil? You go on the olive oil tasting of course…. I knew I loved to eat… I just did realize how much! And I like feeding people, like family and friends, and seeing the food disappear and hearing the ‘Yummm” and the “Wow’s” and empty pots and pans afterwards. I would love to eat my way through the world, but until I can travel everywhere, I will try to cook my way through it.